Cynical Tea Bags are a line of humorously packaged teas. 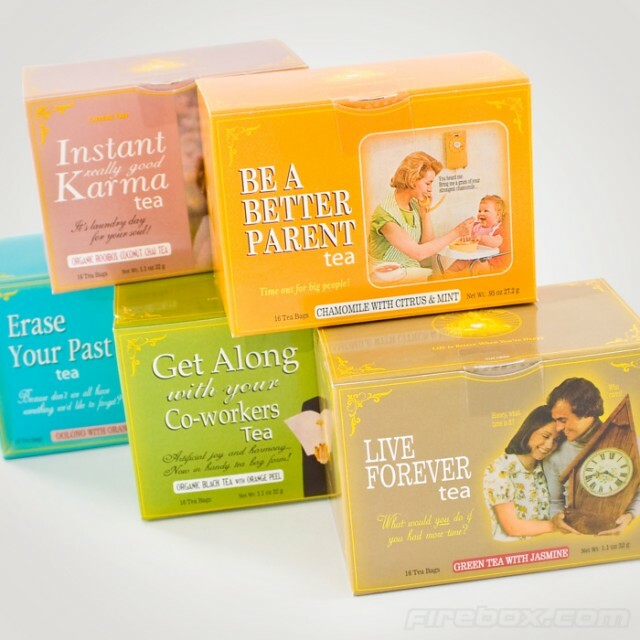 There are five boxes available: Instant Really Good Karma (Rooibos Coconut Chai Tea), Be a Better Parent (Chamomile with Citrus and Mint), Erase Your Past (Oolong with Orange), Get Along With Your Co-Workers (Organic Black Tea with Orange Peel) and Live Forever (Green Tea with Jasmine). If you’d like to have a “tongue in cheek tea time,” boxes of these tea bags are available to purchase at Firebox.